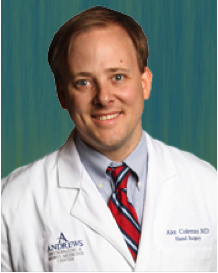 Alex Coleman is a board certified and fellowship trained orthopaedic surgeon specializing in hand, wrist, and elbow reconstruction, as well as microvascular surgery and limb salvage. His practice encompasses the full spectrum of hand and wrist conditions from the simple to the complex, utilizing a broad range of non-surgical treatment regimens, and when necessary, the latest surgical techniques. Dr. Coleman attended The Medical University of South Carolina where he earned his Doctorate of Medicine, graduating at the top of his class. He completed his Orthopaedic surgery residency training at the world renowned Campbell Clinic in Memphis, Tennessee where he was awarded the Program Director’s Award for academic excellence. After residency, he completed a hand and microvascular surgery fellowship at the University of Alabama in Birmingham under the tutelage of Dr. Thomas Hunt, a well-recognized authority on hand and wrist reconstruction in high level athletes. Dr. Coleman is a candidate member of the American Society for Surgery of the Hand as well as the American Academy of Orthopaedic Surgeons. His scholarly interests include biomechanical engineering as well as the design and manufacture of specialized surgical instruments. You are here: Home / Authors / Alex Coleman, M.D.